George Vose stands in front of a Piper PA-12 Super Cruiser at Alpine-Casparis Municipal Airport. Alpine, Texas is a mesmeric city nestled in the Davis Mountains, approximately 200 miles east of El Paso. Often called the “Hub of the Big Bend,” Alpine is a favorite stopover for tourists visiting nearby Big Bend National Park, the Davis Mountains and the University of Texas McDonald Observatory. 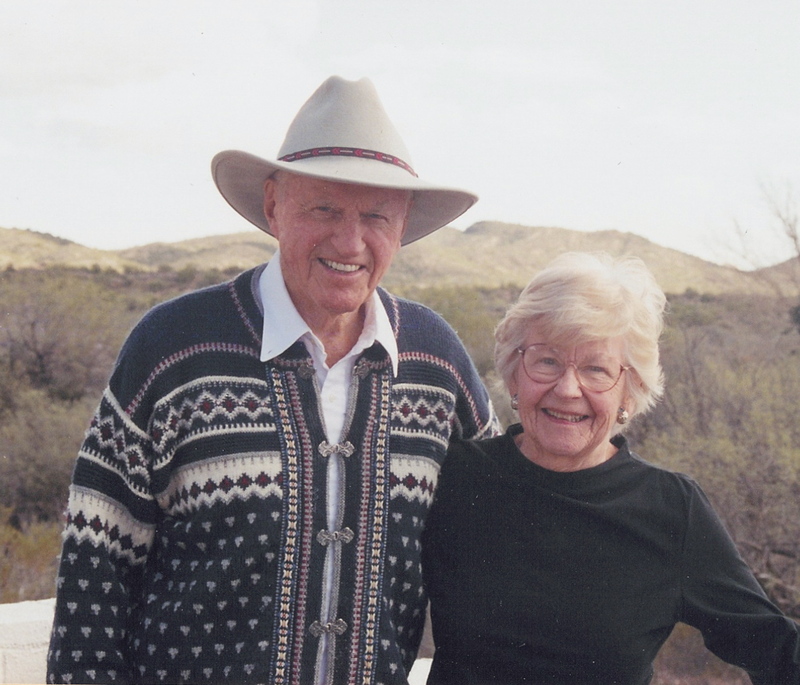 The city supports three museums that primarily focus on geology of the Big Bend and lifestyles of the local ranching community. Sul Ross State University has a stately campus situated on a hill overlooking Alpine. Named for former Texas governor, civil war hero and patriot Lawrence Sullivan Ross, it serves a 19-county area in far West Texas. Due to the city’s remote location, Alpine-Casparis Municipal Airport (E38) plays an important role in supporting the local economy. The 2,100 general aviation visitors each year, along with the GA tenants at the airport, contribute more than $1.9 million in total economic output to the community. There are 22 full-time airport jobs with $727,000 in payroll. Runways 1 and 19 are more than 6,000 feet long. Runway 19 has two instrument approaches: the new global positioning system approach and the older non-directional beacon approach. Locals claim that Alpine-Casparis Muni is one of the oldest, if not the oldest airport in Texas. 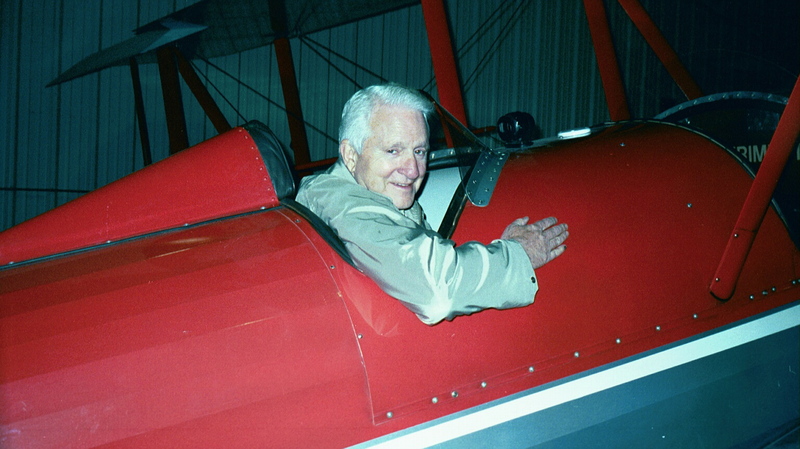 It’s named in honor of local aviation pioneer John “Cas” Casparis, who died in 1984. 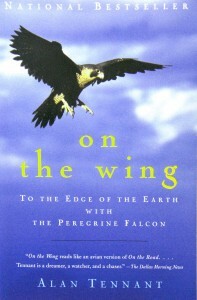 Alan Tennant wrote “On the Wing,” a book about tracking peregrine falcons with George Vose. On a recent visit to Alpine, I sat outside the local E38 FBO office and became engrossed in the quiet and peaceful environment of the Chihuahuan Desert. The cool shade and crisp arid air offer an excellent venue to view the nearby mountains. As I was about to doze off, I heard the crackle of a speaker box connected to the local radio frequency. A pilot was broadcasting his intentions to land in Alpine. 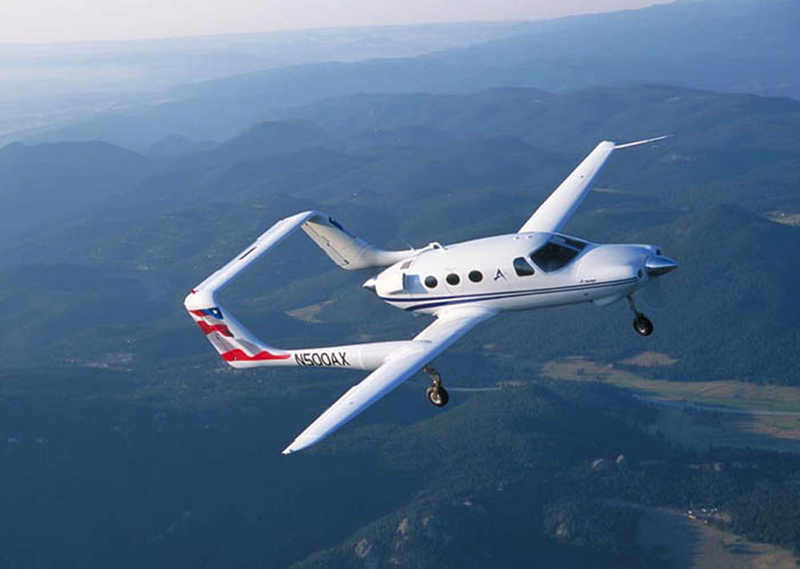 A twin-engine Beechcraft Queen Air entered the pattern, landed and taxied up to the FBO. 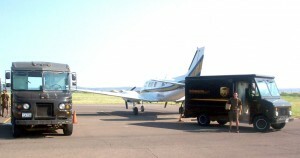 The props had barely stopped spinning when several UPS vehicles surrounded the aircraft. 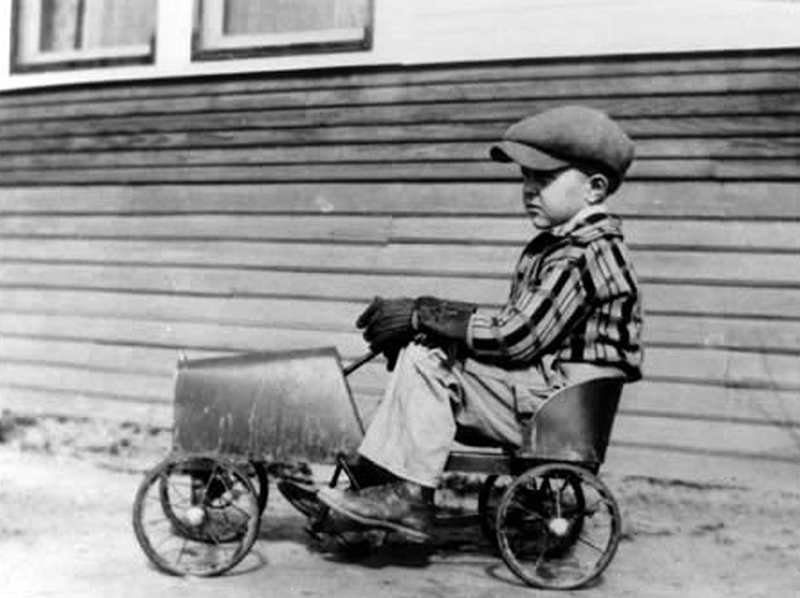 The delivery drivers began to portage many parcels from the airplane into their vans, scurrying like ants on hot cement. Then, as fast as the trucks had arrived, they sped off in several directions to make deliveries. Most drove into town, while one lone truck headed north into the mountains on the Ft. Davis highway. Then sounds of the desert returned: coos from an Inca dove and the drone of distant cicadas. I had landed my Grumman Tiger at Alpine to refuel and meet an illustrious, local pilot. The airport lineman greeted me with typical, warm, West Texas hospitality. Though a stranger, local pilots treat any visitor as though they were some long-lost friend. “Do you need a courtesy car?” asked the FBO attendant. “Oh! Vose! You seek George Vose,” the young man said, before I could finish my sentence. 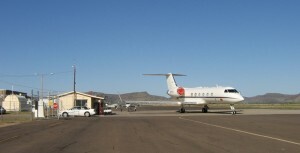 A new Gulfstream IV business jet is parked next to the small terminal building at Alpine-Casparis Municipal Airport. I knew of Vose from viewing the “Imus in the Morning” TV show. For several weeks, Don Imus promoted a book entitled “On the Wing,” by Alan Tennant. By way of background, Vose is one of the main characters of this nonfiction book that spent many weeks on the New York Times Best Seller list. The story begins with Vose and Tennant helping the U.S. Army track the initial migratory flight of peregrine falcons along the Texas Gulf Coast. Using “borrowed” Army radio tracking equipment and flying in a Cessna 172 piloted by Vose, this unlikely pair decide to launch their own adventure, tracking another peregrine falcon that Tennant had caught and tagged with an electronic transmitter. The men didn’t obtain an initial heading of the falcon while on the Gulf of Mexico and locate the bird weeks later, as the Army does. Instead, Tennant and Vose tracked the falcon in the Cessna all the way from Padre Island, Texas, up the front range of the Rocky Mountains, to the peregrine’s summer arctic home on Alaska’s North Slope. UPS trucks surround a Beechcraft Queen Air delivering packages from Dallas. Tennant, who has written many nature books (snakes are his specialty), had taken up the plight of the peregrine falcon because its survival was in danger due to the accumulation of pesticides in the bird’s tissue and bones. Tennant, however, wasn’t comfortable flying in small planes. 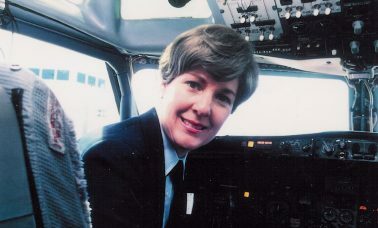 Vose, on the other hand, was a veteran pilot with vast experience flying many types of aircraft, but knew little about migratory routes of birds. 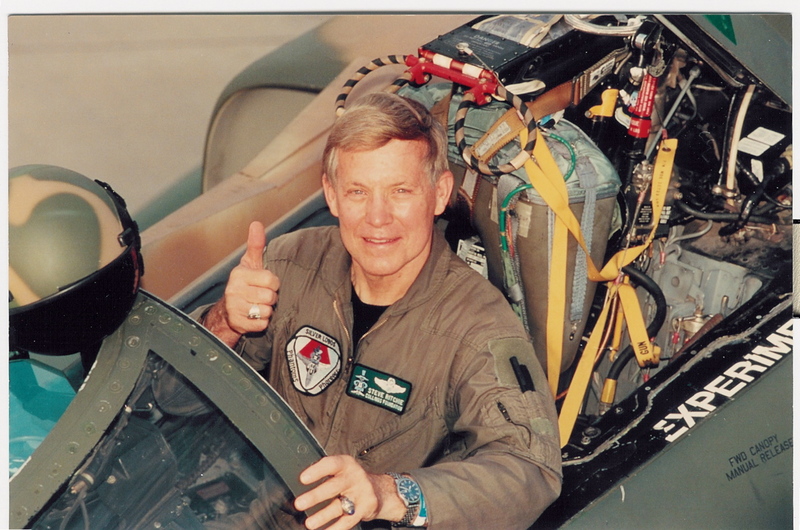 Vose, now in his 80s, realized that his flying career couldn’t last indefinitely and was glad to have the opportunity to fly this precarious course, tracking an unseen falcon. Vose and Tennant, an odd couple indeed, became close comrades while encountering difficult times. Back at the Alpine FBO, a vintage Piper PA-12 Super Cruiser taxied to the self-serve gas pump. 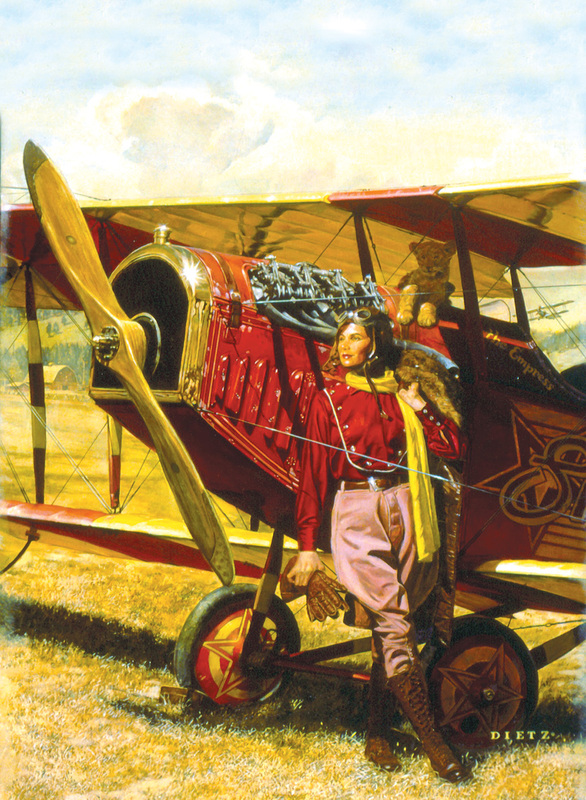 A young man named Cade Woodward emerged from the cockpit. He said he was a student pilot, learning to fly from Vose. As if on cue, in walked a tall, distinguished-looking gentleman with snow-white hair, moustache and goatee. It was Vose himself. He had driven up from his airstrip south of Alpine. After a brief introduction, he poured a cup of coffee and stirred in a spoonful of sugar. 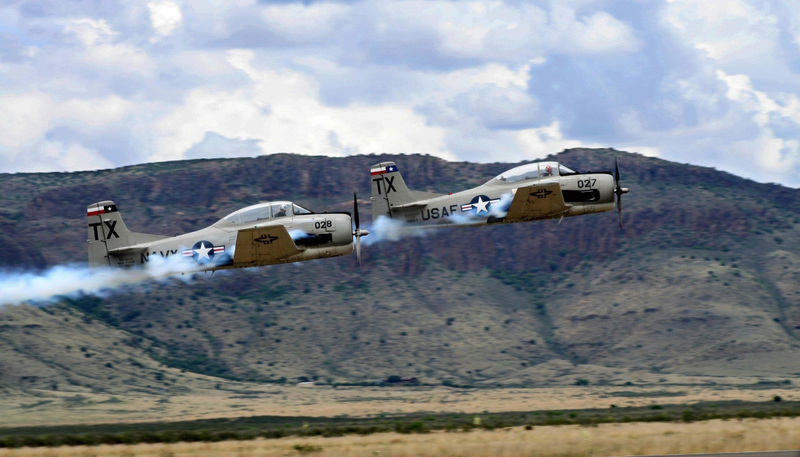 Backed by the Davis Mountains, two Raytheon T-34 Air Force training aircraft fly over the 2007 Big Bend Air Show. 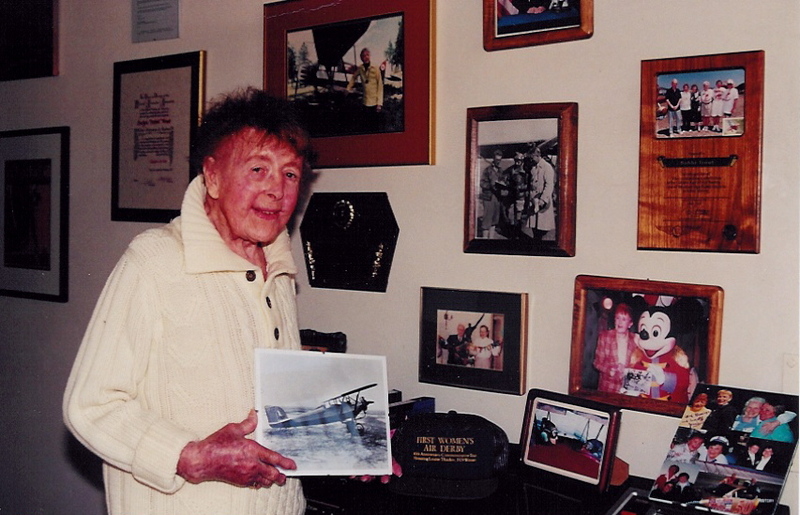 Vose, who started flying in Maine around 1939, has been instructing since 1943, logging more than 23,500 hours. 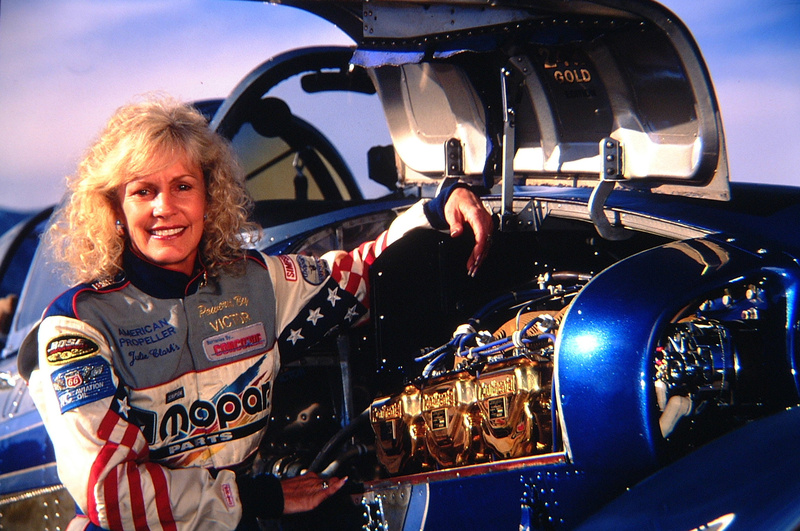 He was awarded the Wright Brothers Master Pilot certificate from FAA Administrator Marion Blakey in 2005. 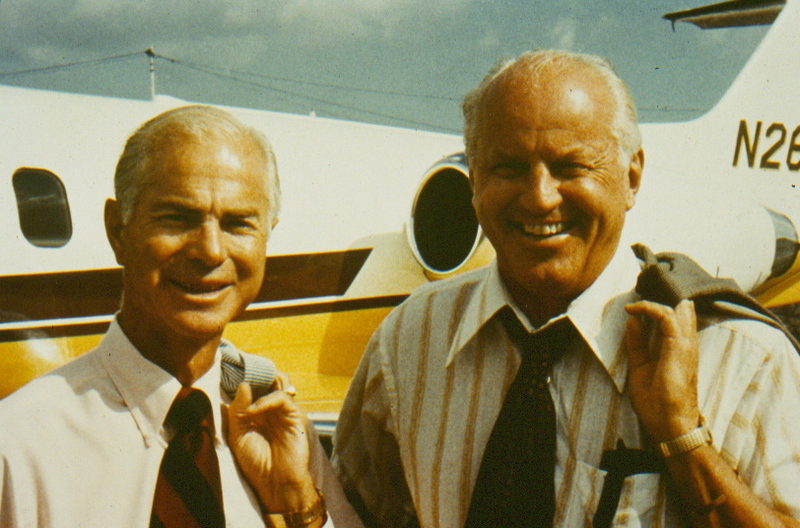 One requirement for this award is 50 or more continuous years of commercial aviation. 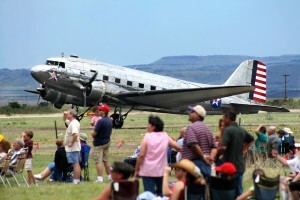 The C-47 Bluebonnet Belle taxis in front of a crowd at the 2007 Big Bend Air Show. I asked Vose if he ever met John Casparis. 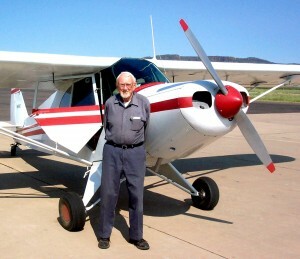 Vose, now 86 years young, says he plans to continue supporting general aviation, teaching pilots and tracking animals. 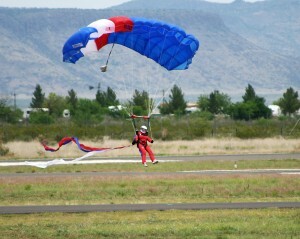 “As long as I can continue to pass my medical exam, I’ll be flying,” he vows. Steve Belardo, one of many local pilots who learned to fly from Vose, helped organize the first Big Bend Air Show, held May 25-26, 2007, at the Alpine airport. Belardo said the air show’s purpose was to promote general aviation by drawing the attention of the non-flying public to the value of the airport. Belardo added that the airport also serves as a staging point for government agencies, such as the U.S. Border Patrol, Drug Enforcement Agency and local law enforcement. 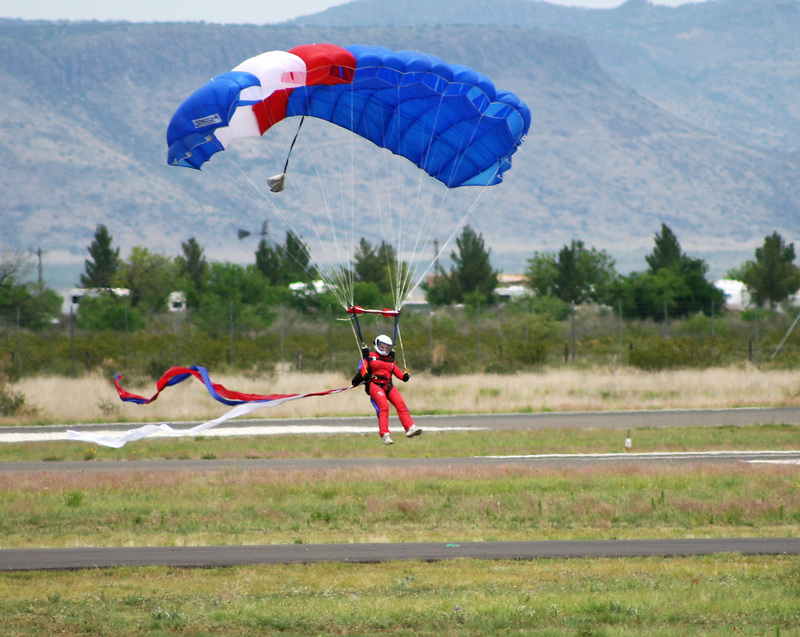 A skydiver flares his parachute for the crowd at the 2007 Big Bend Air Show. Apparently, Belardo was right; the inaugural Big Bend Air Show attracted more than 2,000 people. The show boasted vendors, a VIP pilot supper and static displays of various aircraft, such as a vintage Douglas C47, Mitchell B-25 bomber, aerobatic aircraft, skydivers and much more. Major sponsors included CBS Channel 7 from Midland/Odessa, the Alpine Chamber of Commerce, the Alpine City Council, the Big Bend Regional Medical Center and Rainbow Adobe Homebuilders, along with support from other local businesses and private citizens. The Texas Department of Public Safety set up a display booth, complete with a helicopter and six troopers, to answer visitor queries. The air show benefited the Family Crisis Center of the Big Bend. Many believe that because of its remote location, Alpine and Alpine-Casparis Municipal Airport are sleepy spots on the map, where little happens. But, I found the city and its airport an active and friendly base for visiting the majestic and Big Bend area of Texas. For more information about Alpine-Casparis Municipal Airport, visit [http://www.airnav.com/airport/E38].